Often the commonest small sandpipers on passage and in winter in the region. In summer plumage, colour on face, neck, breast and scapulars varies from dull orange to warm buff: always shows a pale ‘V’ on mantle and dark centre to crown; in this plumage confusion with Sanderling possible but note small size of Little Stint and pale ‘V’ on mantle. In winter, upperparts become grey, usually with dark shaft-streaks to feathers. Juvenile, which looks very white below, has warm rufous tone to upperparts, a distinct white ‘V’ on mantle, diffuse greyish neck-collar and rufous, streaked breast sides. 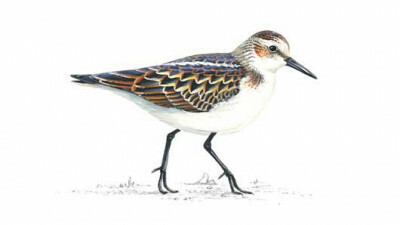 Always has dark bill and legs, the latter important for separation from Temminck’s Stint which has yellowish grey legs.